One post often leads to another in this blog and this one is no exception. 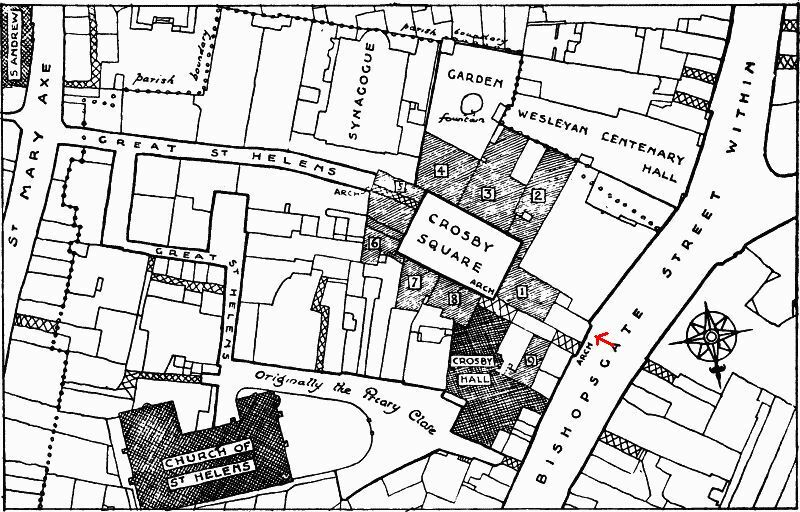 The previous post was on John Colley of Bishopsgate Street of whom Charles Snelling was to learn his trade, but as we will see, this post in turn leads to yet another, but first some information on the address where Snelling could be found in the early part of his career. Wellington Street was and is again part of Borough High Street, but the first section coming from London Bridge was called Wellington Street after the Duke of Wellington for a while (from somewhere in the 1830s to 1890 or thereabouts). 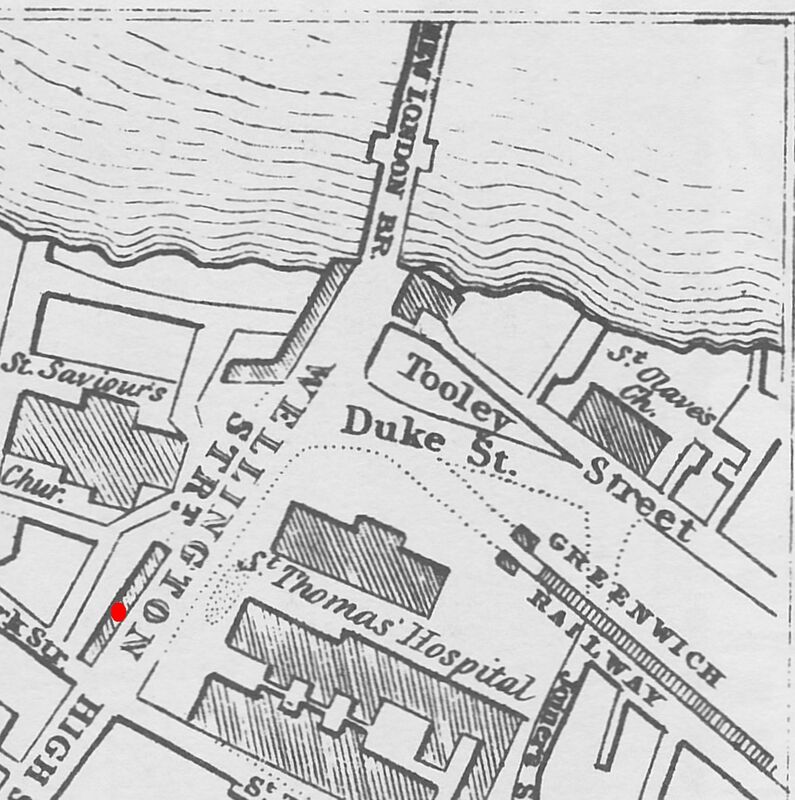 Snelling’s shop was just beyond St. Saviour’s, in the middle of the row of houses between the church and York Street and opposite St. Thomas’s Hospital. In fact, slightly more towards the bridge from where the entrance to Borough Market now is. As mentioned above, Charles Snelling served his apprenticeship with John Colley of Bishopsgate Street. Snelling’s indenture was dated 6 September 1825 and lists his father as Henry Snelling, barber. Henry paid Colley twenty pounds for the privilege of teaching his son the art of hairdressing and perfumery. Charles would have come to the end of his apprenticeship in 1832, but he did not take up the formal freedom of the City of London until 1841. No doubt because he had no need for it running his business on the south side of the Thames. At the end of 1833, the partnership between Henry and Charles Snelling was dissolved and Charles continued at 11 Wellington Street on his own. (1) In 1838, he married Louisa Knowles, the daughter of a naval officer. 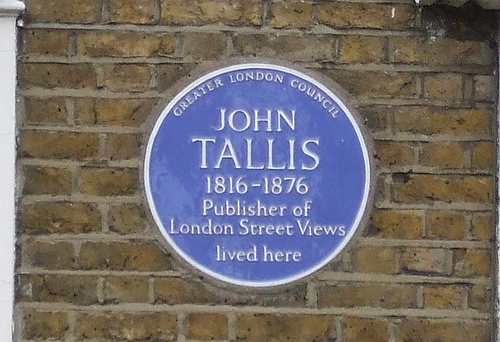 Tallis only just caught Snelling in Wellington Street, because soon after the Street View booklet appeared, Charles moved to 20 Gracechurch Street where the 1841 census was to find him and his growing family. 1841 was also the year in which he obtained the freedom of the City of London, something he had no need for at his previous address, but did in Gracechurch Street as that street lies within the jurisdiction of the City. 20 Gracechurch Street had been the shop of Nathaniel Pryor, a jeweller, and after Pryor’s death, of his widow Elizabeth (blog post on them here). 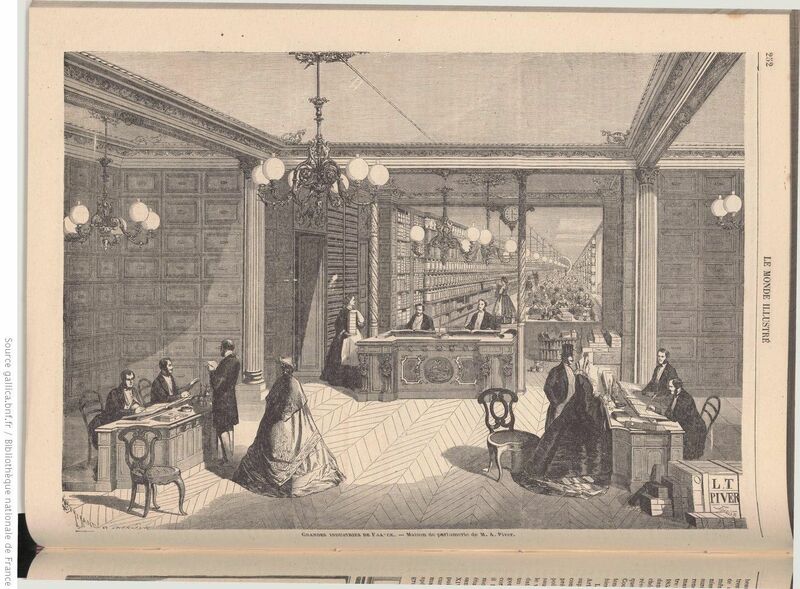 Charles continued to work in Gracechurch Street and the 1851 census, which was taken on 30 March, finds him there with a shopwoman [Postscript: when I wrote this post, I totally ignored her, but I should not have. See the comment by Melissa why Emma Whitehead should have been noticed] and a visitor, an accountant. Having this visitor, one Samuel Stockton, did not bode well for Snelling. It may, of course, have been an ordinary visit from a friend, but on the 23rd of April, a claim for bankruptcy was filed in the Court of Bankruptcy and Snelling was to appear before the Court on the 19th of May. (2) He was given a certificate of the second class, that is, Snelling had been careless or reckless, but not dishonest, and could partially have avoided bankruptcy, or so the Court of Bankruptcy ruled. Any idea of misfortune without blame was apparently not a valid reason. The last chance for creditors to stake their claim was on 17 January 1852 or they would forfeit any dividends. (3) And on the 11th of May, 1852, or on subsequent Tuesdays, the “creditors who have proved their debts […] may receive a First Dividend of 6d. in the pound” from Isaac Nicholson of 24 Basinghall Street, the offical assignee. (4) No more is written about Charles in The London Gazette, but let’s assume he survived the bankruptcy proceedings and continued to work as a hairdresser and perfumer, although I have not discovered anything about him after 1852. And what happened at Snelling’s old address in Wellington Street? Briefly, George Philcox, a clock and watch maker, was listed at the address, but already on 2 March 1841, he was insolvent and in Surrey Goal. Next come Batchelor and Rogers, drapers, who are mentioned in Robson’s Directory of 1842. Henry Batchelor and James Baker Rogers, mercers, linen drapers and haberdashers, dissolve their partnership on 14 July 1843. And there was a reason for breaking up the partnership. Just two days earlier, they had assigned all their “stock in trade, bills of exchange and promissory notes, and other securities for money, book and other debts, books of account, and all other the estates, moneys, property and effects, wheresoever and whatsoever (except leasehold estates) … for the benefit of the creditors”. (5) I am afraid that 11 Wellington Street figured prominently in the bankruptcy notices in The London Gazette. (1) The London Gazette, 31 December 1833. (2) The London Gazette, 25 April 1851. (3) The London Gazette, 30 December 1851. (4) The London Gazette, 7 May 1852. (5) The London Gazette, 18 July and 29 August 1843. In 1862, the German poet and author Julius Rodenberg wrote a book about his visit to London, Tag und Nacht in London (online here) in which he describes the streets, the markets and the people of the City. When he explains what could be seen in Regent Street he relates how in the afternoon the nobility and gentry come in their carriages (which he likens to four-poster beds on wheels) to gaze at the goods on offer behind the large shop windows – and to be seen themselves of course. According to Rodenberg, Regent Street is the street of fashion and luxury that smells of spring flowers and a jockey club. The latter not suprising with all the horse-drawn carriages, but spring flowers? But read on and it becomes clear that the fragrant smells emanate from the perfumery shop of Piver where inside the walls of gold and brown the glass scent-bottles and soft gloves are what catch your eye. 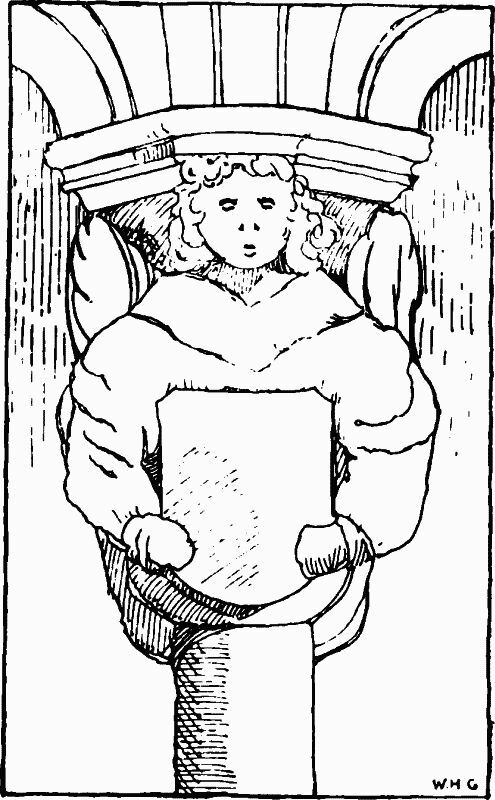 Rodenberg refers to the shop of L.T. 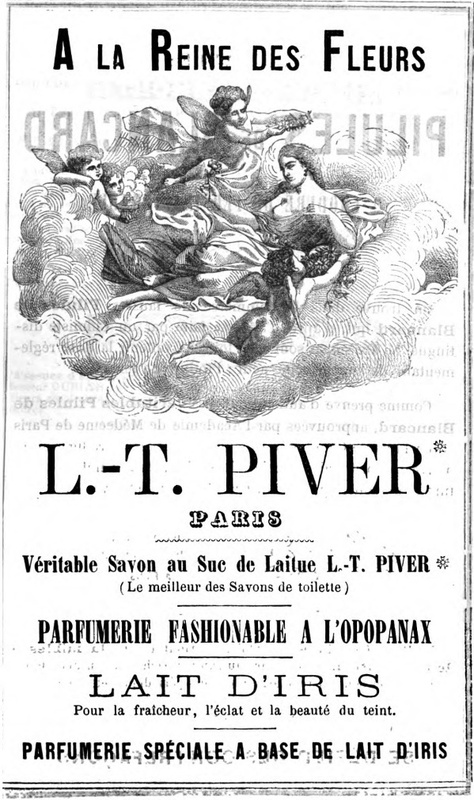 Piver, a company that had started life in France in 1774 as a small business that sold perfumed gloves. Michel Adam Piver was the founder, later succeeded by his cousin Paul Guillaume Dissey. 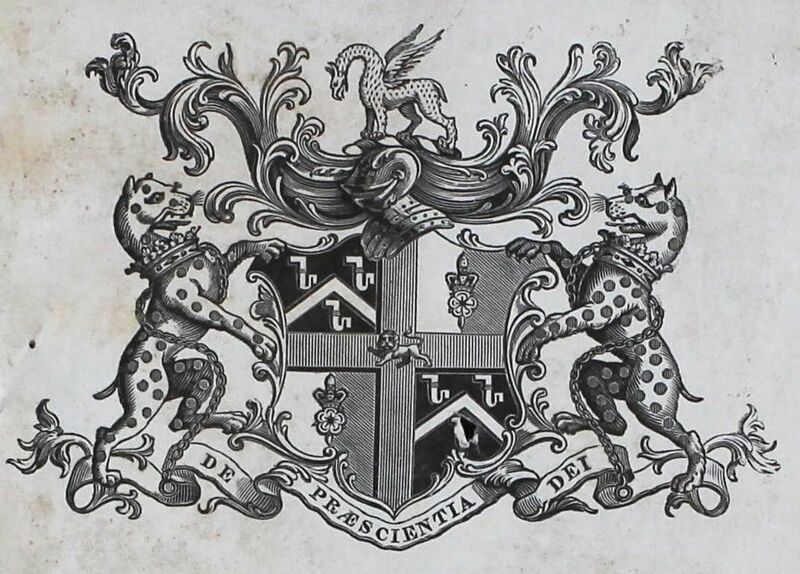 In 1813 Louis-Toussaint Piver became a partner and after Dissey had died, L.T.’s initials were added to the company name, which it kept even when he was succeeded by Alphonse. 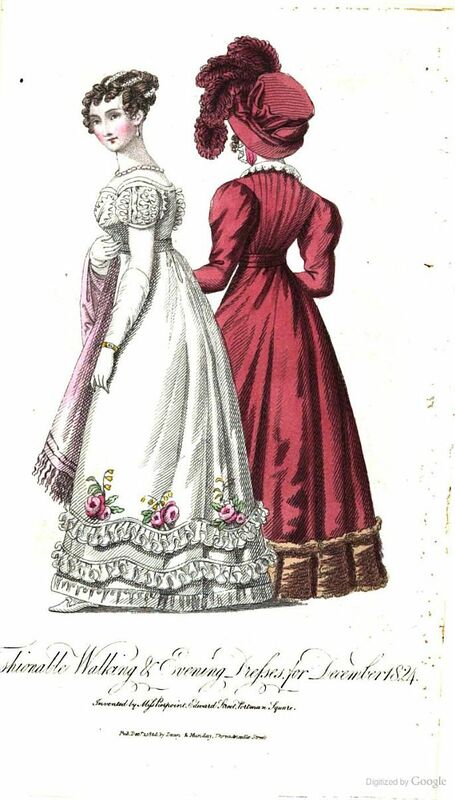 Eventually, the firm had shops all over the fashionable world and from the 1840s also in London. 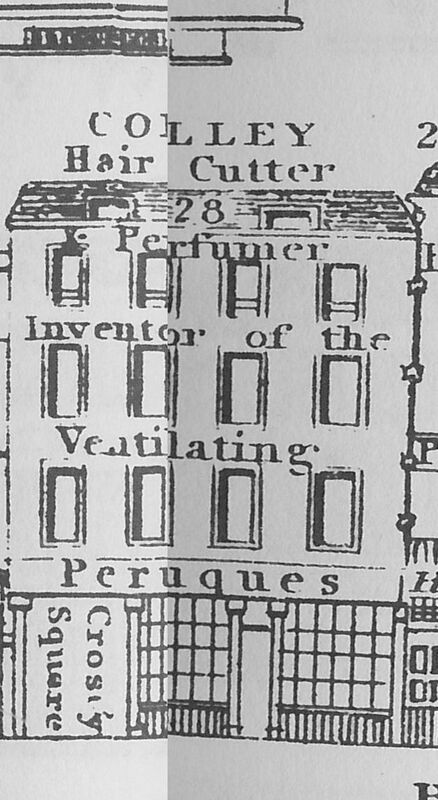 The first batch of Tallis Street Views (1839) still shows Gosnell, John and Co., perfumers to the Royal Family, at number 160, but in 1847 when the Supplement Street Views came out, Piver had moved in. According to the records kept on “alien arrivals” [don’t worry, they were not from Mars, alien was used where we would nowadays say foreign], Alphonse Piver came over from France via Dover in 1849 and again in 1851. He did not live in London; the shop in Regent Street was managed by Jules or Charles Lauvergnat. In the 1851 census, it is Jules who lives above the shop; in 1861 it is Charles and his wife Eliza; and in 1871 Jules is back with wife Amelia. 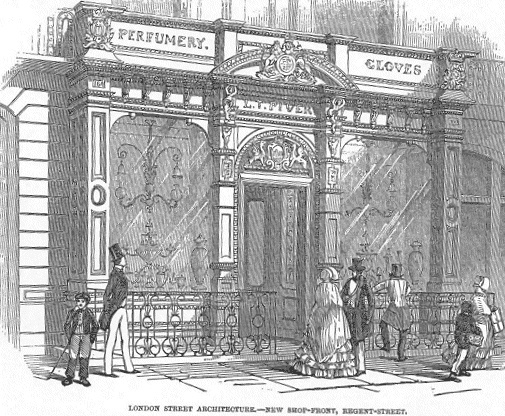 By 1880, Piver no longer had a shop in Regent Street and we find an advertisement for their stock of gloves that could be bought at “a large discount” at Peter Robinson’s in Oxford Street. (1) The 1881 census gives “being rebuilt” for number 160. 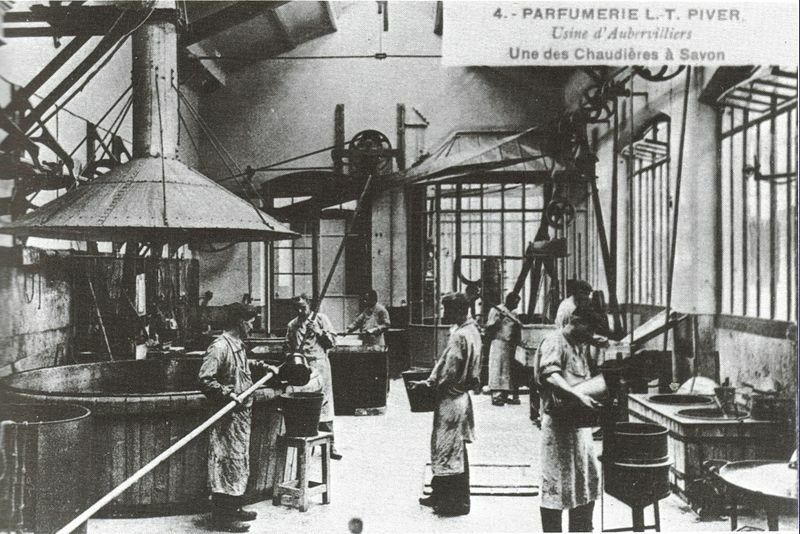 But the firm continued to flourish in France, bringing out new scents on a regular basis and also improving the processes of making the perfumes. 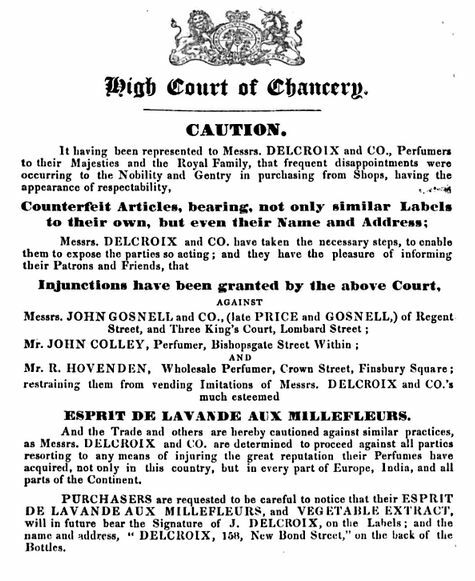 In 1874, for instance, the London Gazette of 6 March lists a patent for Alphonse Piver of no. 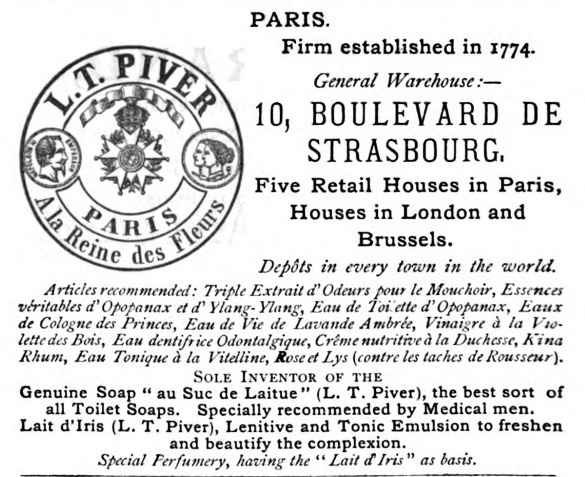 10, Boulevard de Strasbourg, for the invention of “improvements in the distillation of essential oils or perfumes”. And in the paper of 18 May 1877, Alphonse receives a patent for “a new process of manufacturing alcohols by a methodical and endless manner with wines and fermented juices of any kind by means of new or improved apparatuses suitably disposed for the purpose”. 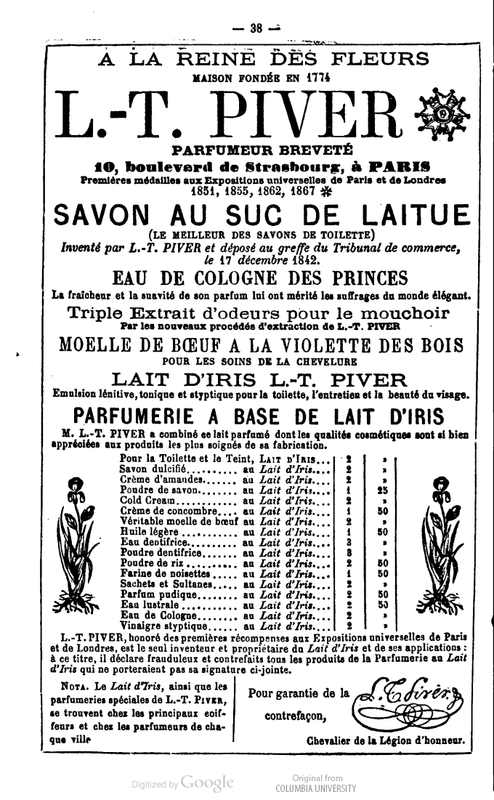 Already in 1860, Eugène Rimmel, another great perfumer, describes a process invented by Piver “to extract the aroma of flowers by the pneumatic principle” whereby “a strong current of air is forced, by means of an air-pump, into a receiver filled with fresh flowers, and passes into a cylinder containing grease in a liquefied state, which is kept in constant motion”. (2) You can read the whole process here. I found this picture on Wikipedia Commons of one of Piver’s factories in Aubervilliers where they made their cosmetic products. 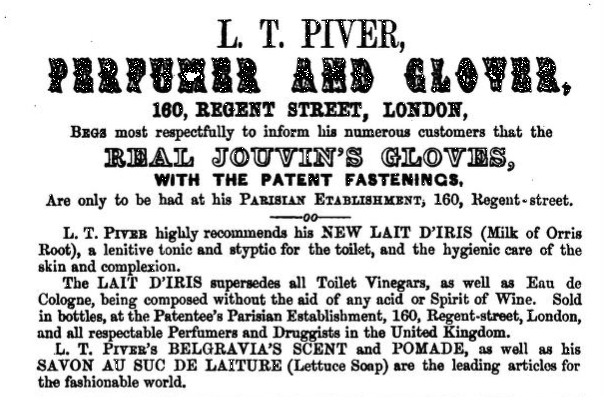 The gloves Piver sold were Jouvin’s patent French kid gloves and according to an advertisement in The Observer of 19 May, 1850, Piver had the exclusive sale of these gloves in the UK. 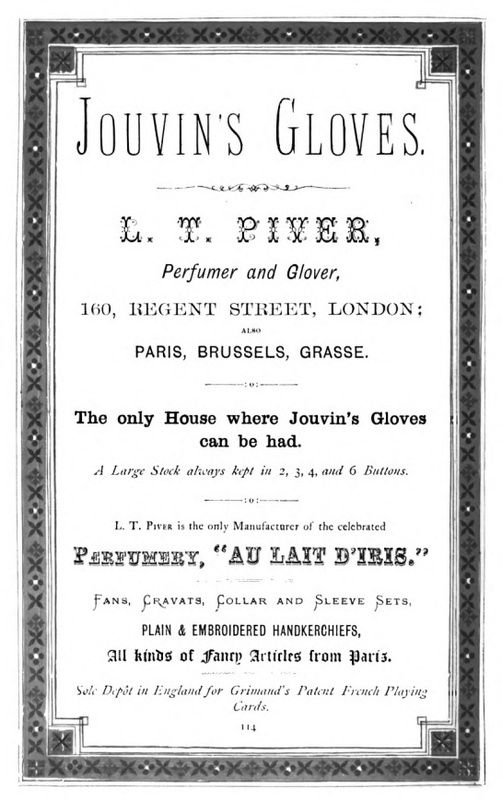 Jouvin had received a gold medal for his gloves at the 1849 Paris Exhibition “for the quality and great perfection of his make”. Because they were so popular, counterfeits were being made and buyers were urged to check that their gloves had the stamp “Brevet d’Invention Gants Jouvin”. The fancy scent bottles that so attracted Julius Rodenberg and their modern successors can still be found in large numbers by searching the internet, but I thought these two small pots more appealing. They were salvaged from the shipwreck of the SS Republic, a steamship that sank in 1865 in a hurricane while on its way from New York to New Orleans. The passengers and crew fortunately escaped, but the valuable cargo of gold and silver coins sank to the bottom. 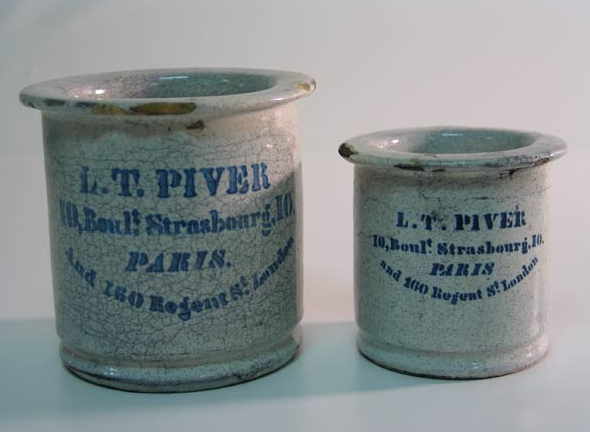 In 2003-2004 some 51,000 coins were salvaged, along with 14,000 artefacts, among which 50 stoneware pots in two sizes, transfer-printed with Piver’s name. The Piver firm advertised in many newspapers, books and magazines, far too many to show here, but below a small selection. (1) The Graphic, 11 September 1880. (2) “M. 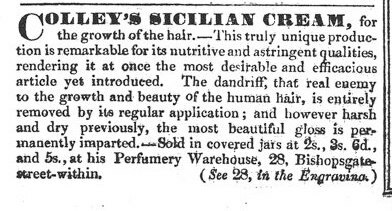 Rimmel on Perfumery” in The Chemical News and Journal of Industrial Science, 1860.